One bad day. Freed once again from the confines of Arkham Asylum, The Joker is out to prove a deranged point. And he's going to use Gotham City's top cop, commissioner Jim Gordon, and his brilliant daughter Barbara (a.k.a. Batgirl) to do it. Now Batman must race to stop his archnemesis before his reign of terror claims two of the Dark Knight's closest friends. Critically acclaimed writer Alan Moore redefined the superhero with Watchmen and V for Vendetta. In Batman: The Killing Joke, he takes on the origin of comics' greatest super-villain, The Joker, and changes Batman's world forever. 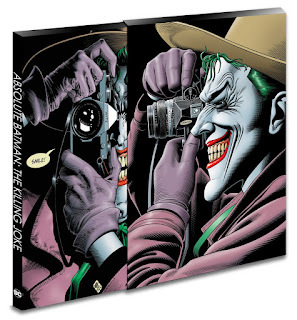 Absolute Batman: The Killing Joke: 30th Anniversary Edition includes both the recolored art by artist Brian Bolland and the original colors by John Higgins, along with the never-before-published scripts, and numerous Batman and Joker sketches and stories by Bolland. Collects Batman: Black and White #4; Batman: The Killing Joke; Countdown #31; Cover Story: The DC Comics Art of Brian Bolland; Joker: Last Laugh #1, #6; Joker's Greatest Stories Ever Told; Who's Who in the DC Universe #13 and Wonder Woman #96.